Edmonton Oilers forward Jordan Eberle will be out four to six weeks after sustaining a shoulder injury on Tuesday in pre-season action against the Arizona Coyotes. Eberle took a hit from Kyle Chipchura in the first period and did not return to the game. The Oilers wound up winning the game against Arizona by a final score of 4-0, giving them a 6-0 record in the pre-season. They have two pre-season games to go before opening the regular season on October 8 against the St. Louis Blues. The good news is that the injury won’t require surgery. Eberle hopes to be back to skating within a couple of weeks. The 25-year-old from Regina had been skating on a line with Ryan Nugent-Hopkins and Benoit Pouliot for the pre-season. 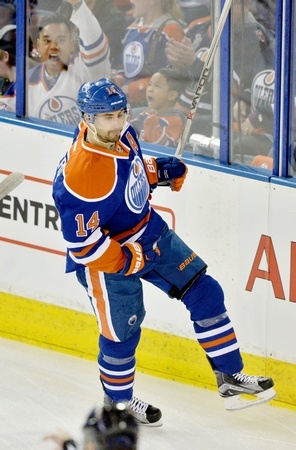 Eberle led the Oilers in scoring last season with 63 points in 81 games, including 24 goals. Edmonton certainly has some forward depth this season, so those opportunities for others could present some interesting combinations. Taylor Hall, Connor McDavid and Teddy Purcell have formed another top line thus far, while Leon Draisaitl has been relatively flexible in different situations. Anton Slepyshev still has a shot to make the big club, too, and could make use of this chance. So while nobody would argue that losing a top scorer is a good thing, this is a storm the Oilers can weather.